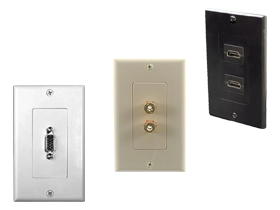 Wall plates offer a versatile placement of inputs to your source units. Home Theater Wall Plates allow you to run your cables and wires inside walls to have a cleaner home theater look. Here at HiFiSoundConnection.com, we have a wide collection of Home Theater Wall Plates with prices that are well within your budget. Grab yours here now and enjoy the biggest savings online!